The art world has seen an undeniable surge in the artist’s book sector in the past 50 years. An interest in the democratic, accessible multiple drove pioneering avant-garde artists of the ’60s to the platform. But still today, 50 years later, the artist book does not have a clear-cut definition: artists work eclectically and are constantly pushing and expanding the bounds of what we accept as an artist book, bringing in various developments to aid in their artistic endeavors. Rebecca Michaels and Miles DeCoster, while students at the School of the Art Institute of Chicago in 1978, used the innovation of offset printing to print the inventive school’s newsletter zine Crumbs. The Popcorn Issue (Miles DeCoster Archives) (1978), for instance, features a printed image of popcorn on one side, the news on the other, the sheet crumpled into a paper ball to resemble a popcorn kernel.← Tony White, Production, Not Reproduction (New York, NY: The Center for Book Arts, 2007), 9. 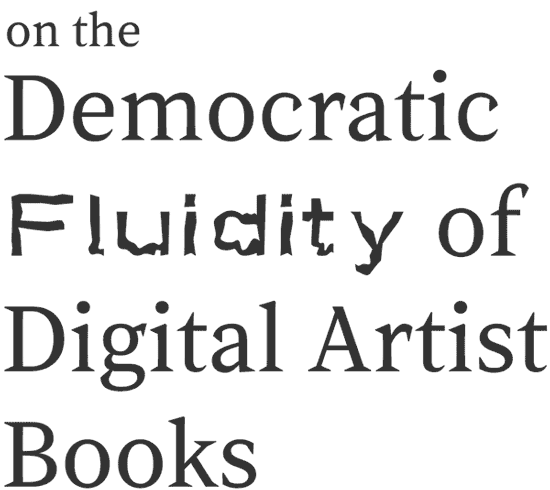 In the rise of the digital age, artists today are increasingly turning to digital platforms to produce, publish, and distribute their works, unbinding them from the many limitations in traditional book publishing, allowing them a more accessible and democratic platform in book publishing and distribution. A pioneering interest that catalyzed the rise of artist publications was the accessibility the democratic platform provided to a wide, everyday audience: the book could reach thousands of viewers, and be collectively owned and accessed by a range of newly-formed collectors, dethroning the traditionally institutional collector and their inherent capitalizing power over artwork. Still, the platform wasn’t completely accessible to non-established artists—a problem that remains today. Production costs and unavailability to alternative presses have inhibited artists’ means to the platform.← Mills, Susanne. “Small Editions”. Book Binding Now. Podcast audio, April 30, 2014. Generally, established artists have more access to larger projects—sculptor and installation artist Darren Bader, for example, has published with New York City’s renowned independent publisher Primary Information. Bader’s work 77 and/or 58 and/with 19 (Primary Information) states at intro that the book is “a selection of artworks by Darren Bader. Each text is a single work. Images appear as necessary” and his closing statements include a thank you to “the people who have bought [his] work”—though the artist has, as illustrated especially by these excerpts, created a relatively democratic base of collectors, it is worth questioning how he came to have access to that creation.← Darren Bader, 77 And/or 58 And/or 19 (Brooklyn, NY: Primary Information, 2015). 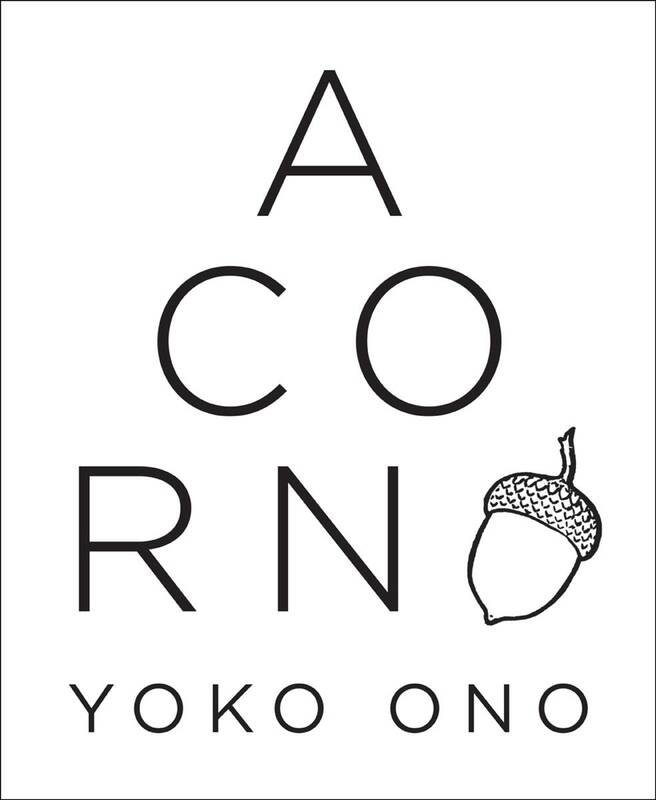 Avant-garde conceptual artist Yoko Ono similarly published her book Acorn (OR Books) in 2013 through publishing house Algonquin Books, the literary house that also published the mainstream bestseller Water for Elephants (Bach Books) by Sara Gruen.← Yoko Ono, Acorn (Chapel Hill, North Carolina: Algonquin Books of Chapel Hill, 2013). Although the artist has graciously given collectional access to thousands, Ono herself had receptive access to an established publishing house arguably thanks to her already long-established career. Again, the question of egalitarian authorship stands. The long-standing question of total, true, start-to-end accessibility is reconciled by the digital book and recent developments in this sector. Artist Paul Chan, founder of digital publisher Badlands Unlimited, remarks that “historical distinctions between books, files, and artworks are dissolving rapidly”. He more pointedly distinguishes that the e-book The Help, A Companion Guide (Badlands Unlimited) by Rachel Harrison came to fruition more rapidly and more cheaply thanks to its digital platform.← “Expanding the Book: An Interview with Badlands Unlimited,” Walker Art Center, December 18, 2012, accessed April 20, 2016. The institutional aspect of the publisher and artist relationship remains, but it is arguably one less of status and hierarchical systems, and more of community: the digital platform allows for a collective voice in their distribution, symbiotically exposing their work to a wider and wider audience. The publisher in this form holds less authority, existing less as a governor of the works or artists supported and represented, and more as a hub of ideas that coincide with one another. Unlike a gallery or a physical publisher, which require prior funds and a reliable business model, a digital publisher can be a much more grassroots-oriented initiative. Chan proposes that “publishers tend to standardize and optimize formats, while artists often want to extend, corrupt, and conflate formats”.← “Expanding the Book: An Interview with Badlands Unlimited,” Walker Art Center, December 18, 2012, accessed April 20, 2016. This conflict, however, is absolved when the artist is given full power over their book. 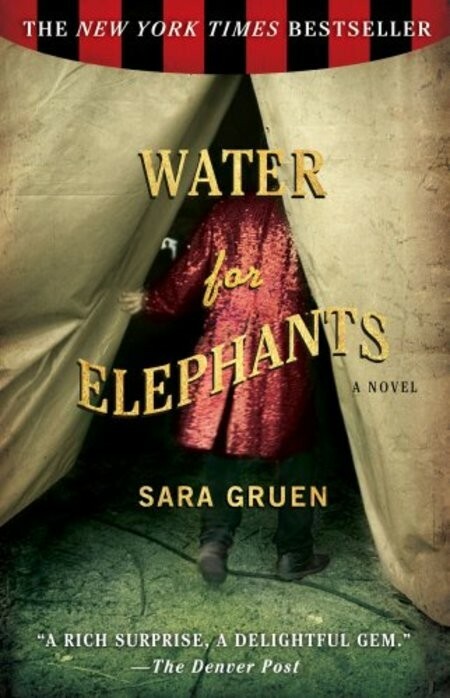 The conceptual freedom allowed by independent, self-publishing (made more accessible by the digital) can broaden a project’s audience more rapidly. Emily Segal, one of the three founding members of brand forecasting agency K-Hole attributes the project’s success to its independent origins: “because we weren’t … in a real business context, we were actually capable of talking about things in a new way”.← Danielle Sacks, “That’s A Total K-Hole Thing to Do,” Fast Company (Fast Company), November 3, 2015. The collective was initiated by three freshly-graduated RISD and Brown students as an art project exploration of cultures in commerce and branding. Each publication focuses on one forecast and discusses ideas around the selected phenomenon by “humorously playing with … neologisms, making up a word like fragmoretation (OR Books) to name a phenomenon” to “earnestly [describe] a principle playing out in the world of branding”.← See above citation. Existing solely on the internet, the PDF documents have been published seasonally from the project’s conception and are always downloadable straight from their site K-Hole.com . At the third year of running the project, one of their forecasted trends, coined “normcore”, caught on in the mainstream fashion industry, and was subsequently adopted by Gap (himechannocorner) and Michael Kors (John Lewis) . Following this flash of virality, the collective was approached by brands like Nike and Samsung in request of brand and marketing consulting. 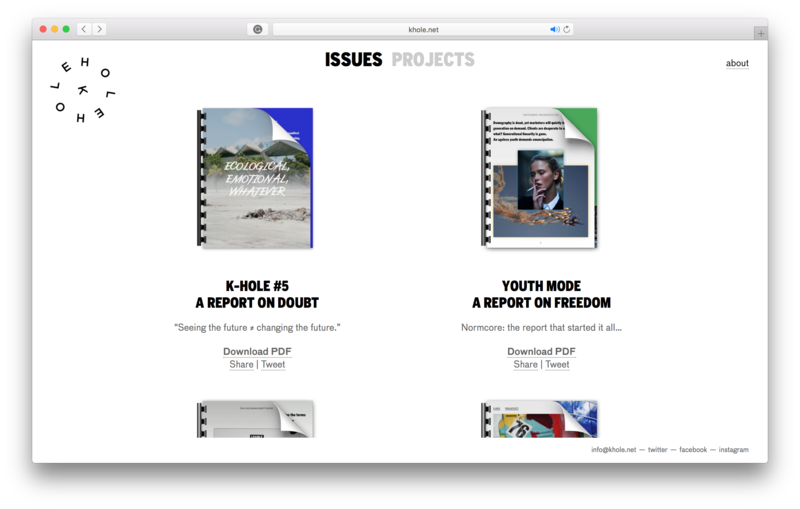 The group now works as a brand consulting agency along with their discerning, satirical art practice, and cite clients like Kickstarter, Coach, MTV, and Stella Artois in their “about” page.← “About,” K-Hole, accessed May 1, 2016. The group was able to utilize digital resources to make original, satisfying, and interesting work, which in turn helped their project grow while maintaining conceptual and artistic integrity. When considering the process of the making of a digital artist book, a few major software programs come to mind: mainly InDesign, Illustrator, and Apple’s iBook Author. Paul Chan comments on Apple’s software, particularly that “iBooks Author markets itself as the GarageBand for e-books [and] is pretty user-friendly as much as it is pretty user-frustrating. After stripping and copy-pasting its own template and finding ways to cheat Apple’s template limitations the e-book kind of developed its own Badlands theme. It feels pretty seamless flipping through it”.← “Expanding the Book”. Thus, after a slight learning curve, the artist and the publishing team at Badlands were able to find ways to express their concept through iBooks Author’s existing platforms and limitations. Still, the learning curve might hinder complete accessibility to those more challenged by limitations to Apple products, or lacking the technological literacy to fully render their concept. Artist collective The Present Group used the populist platform Kickstarter in 2013 to fund the project The People’s E-Book, a web application that aims to help users easily craft (code!) a digital artist’s book. The program introduces itself as “a free, beautifully-simple tool to make e-books better.”← “The People’s E-Book,” October 11, 2013, accessed April 20, 2016. In the project’s mission statement, the founders address that EPUB digital formats often require coding and editing literacy, which might hinder the book’s full fruition in form and content. Time and cost limitations are also gaps that the project seeks to patch, as consultant Eleanor Oliver of The Present Group proposes: “by lowering the barrier to entry, both in term of time and money, e-books could be a realistic platform for all sorts of creative activity”.← “The People’s E-Book Video,” accessed April 20, 2016. The project’s page, assures that the application will always be free, lists that it is compatible with both Macintosh and PC computing systems, and guarantees copyright ownership to all creators. The project was successfully backed by 920 backers to a total of $28,872 (averaging at $31 per investment) from its launch in January 2013 to its deadline a month later, and to this date, the application claims “705 e-books so far, and counting...”.← “The People’s E-Book”. It’s exciting to see a push for authorial democratization in these efforts and the community’s demand and support for them. Its design as an instrument of communication. Its tangible circulation, without being a placard, a private document, or any other form of material. An e-book, Ambeck proposes, follows suit but instead digitally imitates physical attributes native to books.← Mette-Sofie Dianne Ambeck, “Ebooks—Cuckoos in the Nest?,” in Artist’s Book Yearbook 2010-2011, ed. Sarah Bodman (Bristol: Impact Press, 2009). Hopefully, however, in the exploration of definition, we avoid falling into the trap of “is it art?” (“is it book?”), but allow ourselves to explore deeper understandings of what an artist book can be. The digital platform is arguably prime candidate for this expansion, since after all, as proposed by Paul Chan, it is the artist that pushes these bounds and expands these meanings.← “Expanding the Book”. Thus, in the redefinitions of the artist book, let us consider a form that expands on the very original democratic, mass-reaching principles of the platform. The digital realm offers artists great power in its shareability and prone to a more fluid proliferation.